This is sure to become our new Thanksgiving must-have recipe! All the delicious flavors of fall in one hearty bite. 1Preheat your oven to 400 degrees and line a baking sheet with parchment paper. 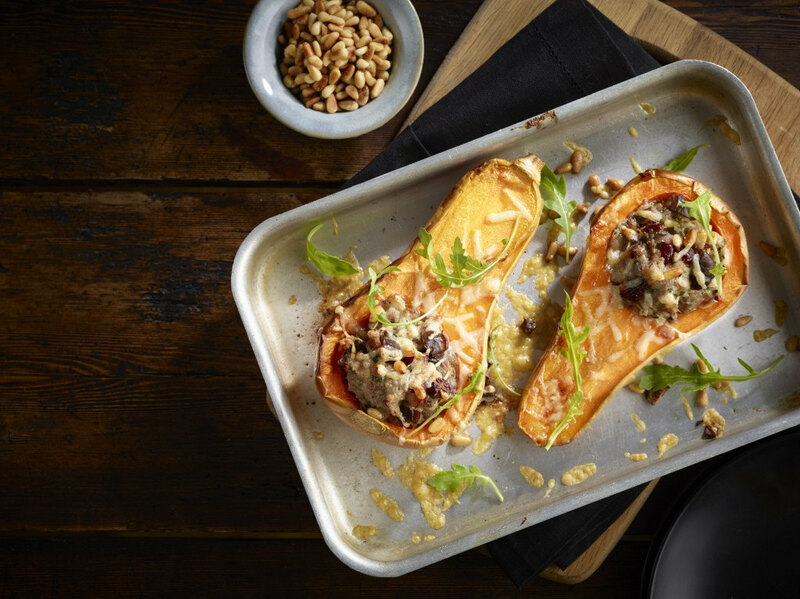 4Place the squash halves open-side down on the baking sheet and roast in the preheated oven for about 20-30 minutes, or until the top of your squash feels tender when gently pressed. You can always check them and continue to roast a few more minutes if they aren't tender enough. Set aside after removing from oven. 6In a medium skillet, heat the ghee or coconut oil over low heat and add all the onions, stirring to coat. Sprinkle with a bit of salt and cook over low heat, stirring every 5 minutes ago to prevent burning. Once onions have been cooking for about 25 minutes and are deep golden brown, remove from heat and set aside. 7While the squash roasts and the onions cook, heat a large saucepan over medium-low heat and add the remaining 2 tsp cooking fat to melt. Add the garlic and cook until just tender, then add all the sausage and increase the heat to medium. 8Cook the sausage and stir to break up lumps, about 5-8 minutes until just browned. Add the apples and herbs and continue to cook, stirring until the apples soften. Add a pinch of salt and pepper and cook, stirring. 9Add the caramelized onions to the sausage mixture, leaving excess cooking fat in the pan. 10Preheat your broiler, then fill halves of the squash with the stuffing mixture. 11Arrange the squash on the baking sheet, stuffing side up, and put under the broiler for 5-10 minutes until the tops get nice and toasty, checking often to prevent burning. Once nice and browned, remove from oven, allow to cool a bit and then serve warm. Enjoy!